Will you join us as we head to parliament in record numbers to demand our MPs end the drug war? Join the lobby on June 25th and meet your MP. Join the Thames Path walk. Why?In the lead up to the United Nations International Day against Drug Abuse and Illicit Trafficking, we are joining our friends at Support Don’t Punish to demonstrate to MPs and the media that there has never been so much support for drug policy reform. 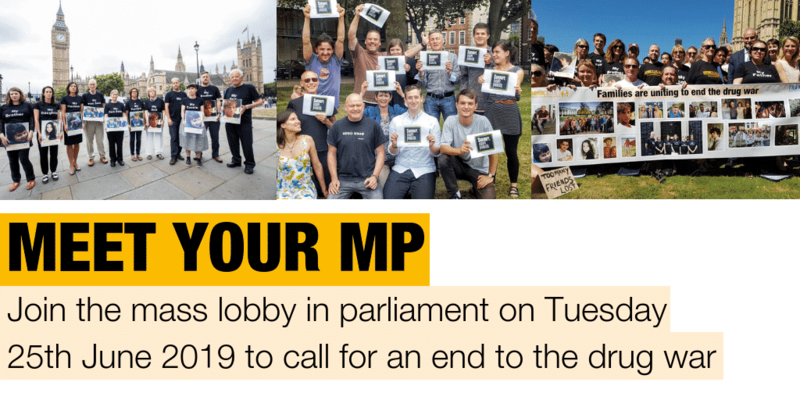 It’s time for MPs to put themselves on the right side of history.We want to buildon the success of last year’s lobby to put more pressure on MPs than ever before.Please email us at info@anyoneschild.org to confirm your attendance and find out more details. Join us! Click the button below to visit the UK parliament website, where you can find your MP’s email address. Write to your MP using this simple guide or use our template. Please copy info@anyoneschild.org into all emails and forward any response to us, so that we can keep track of which MPs are contacted and what they say. MPs are obliged to reply to their constituents, so remember to include your address. Check out our guide for ‘How to meet with your MP’ and become an empowered drug policy activist. Tell your MP that you are concerned about the negative impacts of the UK’s drug policy in your community. Explain why you believe drug policy must change and why regulation would better protect people (e.g. doctors, pharmacists and licensed retailers should control the drug trade rather than organised crime groups). See our debating guide for more ideas. If you have a story to tell, please include it/explain why you personally believe in this. Request a meeting with your MP on June 25th. We have reserved room W2 (off Westminster Hall) from 1.30-5.30, so you can suggest this as a meeting place. If you can’t make this date please see your MP in a surgery appointment in your constituency. Include your full name and address to ensure you get a reply. If you haven’t heard back within a couple of weeks, follow up your request with a polite phone call. Please copy in info@anyoneschild.org to all of your exchanges!